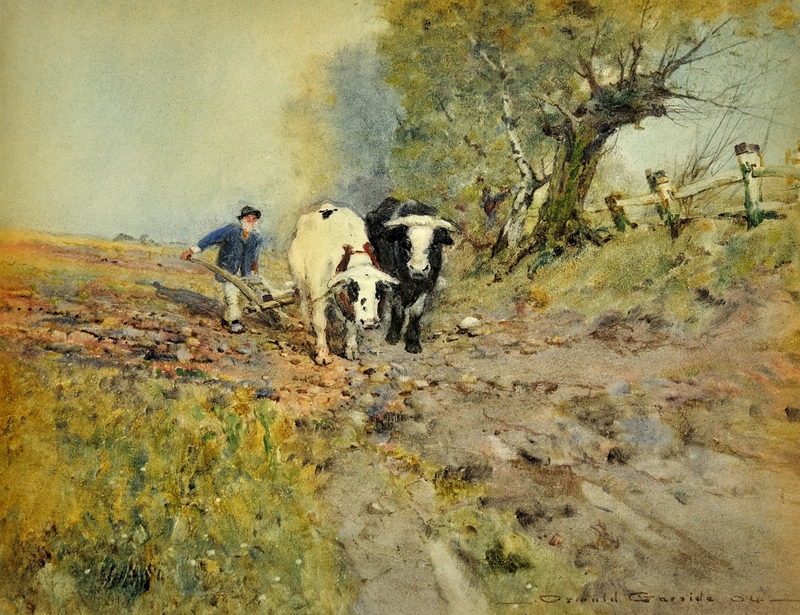 Oswald Garside - No beasts for draught but Bullocks - Online gallery supplying original fine art. Trending Modern British and Contemporary Welsh. Available for sale from Big Sky Fine Art; this original painting by Oswald Garside dated 1904.<br> The watercolour is presented and supplied in a sympathetic contemporary frame to suit the subject colouration, mounted using conservation materials and behind glass.<br> The watercolour is signed and dated 1904 lower right.<br> <br> Oswald Garside was an eminent English landscape artist who flourished in the early part of the twentieth century. He was born in Southport, Lancashire on 3rd August 1879. He was educated in Southport and Warrington and then went to Paris on a Lancashire County Council Scholarship to study at the Academie Julian for three years, followed by and one and a half years in Italy. <br> <br> He took up art full time at the age of 23 and almost immediately he began the exhibiting at the Royal Academy, the Royal Cambrian Academy, the Paris Salon and other prestigious institutions.<br> <br> He was elected to the Royal Institute of Painters in Water Colours in 1916, the Royal Cambrian Academy 1924, and the Royal British Institute in1925. He was also a Member of the Liverpool Academy of Arts, Manchester Academy of Fine Arts and President of the Midlands sketching Club. <br> <br> He was the author of Landscape Painting in Watercolours.<br> Garside lived at 1 White Hart Lane, London and then in Barnes. He died on 10th December 1942.<br> <br> Garside was renowned for his innovative use of mixed media, generally a combination of watercolour, gouache, oil paint and gum Arabic. He painted very widely in Britain, particularly in Lancashire and Cheshire, and also in Holland. His work is in several public collections. <br> <br> This original watercolour shows a charming pastoral scene, in the Victorian English countryside. There is a figure, a farmer, wearing cream trousers, a blue jacket and a hat. He has a white beard. 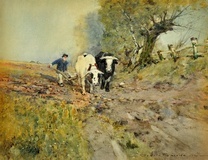 He is guiding two bullocks, or young male cows, who are pulling a basic wooden plough. One of the bullocks is black with a white face, the other is white with small black markings. Both have horns. The ground is rough and hard, with stones and one imagines that the going is tough and this man is but eking out a living. Available for sale from Big Sky Fine Art; this original painting by Oswald Garside dated 1904. The watercolour is presented and supplied in a sympathetic contemporary frame to suit the subject colouration, mounted using conservation materials and behind glass. The watercolour is signed and dated 1904 lower right. Oswald Garside was an eminent English landscape artist who flourished in the early part of the twentieth century. He was born in Southport, Lancashire on 3rd August 1879. He was educated in Southport and Warrington and then went to Paris on a Lancashire County Council Scholarship to study at the Academie Julian for three years, followed by and one and a half years in Italy. He took up art full time at the age of 23 and almost immediately he began the exhibiting at the Royal Academy, the Royal Cambrian Academy, the Paris Salon and other prestigious institutions. He was elected to the Royal Institute of Painters in Water Colours in 1916, the Royal Cambrian Academy 1924, and the Royal British Institute in1925. He was also a Member of the Liverpool Academy of Arts, Manchester Academy of Fine Arts and President of the Midlands sketching Club. He was the author of Landscape Painting in Watercolours. Garside lived at 1 White Hart Lane, London and then in Barnes. He died on 10th December 1942. Garside was renowned for his innovative use of mixed media, generally a combination of watercolour, gouache, oil paint and gum Arabic. He painted very widely in Britain, particularly in Lancashire and Cheshire, and also in Holland. His work is in several public collections. This original watercolour shows a charming pastoral scene, in the Victorian English countryside. There is a figure, a farmer, wearing cream trousers, a blue jacket and a hat. He has a white beard. He is guiding two bullocks, or young male cows, who are pulling a basic wooden plough. One of the bullocks is black with a white face, the other is white with small black markings. Both have horns. The ground is rough and hard, with stones and one imagines that the going is tough and this man is but eking out a living.